Rendered as vector files from L-system or Iterated Function System (IFS) originals, in various iterations and tones, from pure black and white to greys. These are "Planetary Platonic" fractals, suitable in size and accuracy for scales on Earth. Both "classical", or famous, and new fractals are featured here. 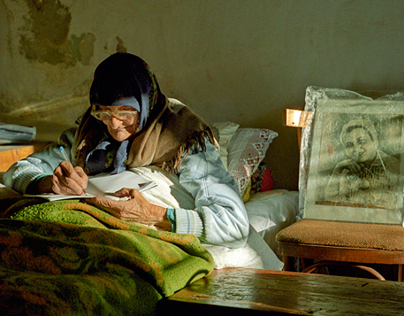 They await a printer large enough to handle their sizes and resolution, and spaces sufficient to display them. Due to their sizes (up to 32 metres across with smallest details at 1 mm), the samples here are small copies of the originals. First described by Waclaw Sierpinski in 1916, the Carpet is the 2-dimensional analogue of the 1-dimensional Cantor Dust. The fractal dimension of the Carpet is approx. 1.8928, and its area at the iteration limit is zero. This version is the 8th iteration. The associated Corel Draw .cdr vector file is 5 x 5 m in size, with smallest details at about 1mm. 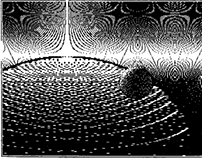 Levy's C curve has dimension 2, but its boundary has a fractal (fractional) dimension of about 1.934. It was first analysed by Ernesto Cesàro in 1906 and G. Farber in 1910, and is named after Paul Pierre Lévy. It is a special case of a de Rham curve, and is also closely related the the Pythagorean Tree fractal. The associated Corel Draw .cdr vector file is 4 x 6.4 m in size, with smallest details at about 1mm. First described by Teiji Takagi in 1903, this curve has no tangents anywhere; it is uniformly continuous but nowhere differentiable, and is a special case of a de Rham curve. Its fractal dimension is 1. Here are shown the 12th iteration constructed from below, and the 1st-15th iterations in greys from above. The associated Corel Draw .cdr vector file is 16.384 x 16.384 m in size, with smallest details at about 1mm. The twindragon curve is made from two dragon curves put end to end, as shown here. It is also a tile of the plane. The associated Corel Draw .cdr vector file is 1.832 x 1.386 m in size, with smallest details at about 1mm. The dragon curve is also known as the Harter-Heighway curve, and was described by Martin Gardner in his Mathematical Games column in Scientific American magazine in 1967. It tiles the plane in several different ways. Here are shown iterations 1-18, in greys. The associated Corel Draw .cdr vector file is 1.497 x 0.997 m in size, with smallest details at about 1mm. 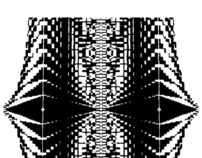 The other name for the Cantor function; it is continuous everywhere, and two of them tile a square. Here are shown the 1st-12th iterations, in greys. The associated Corel Draw .cdr vector file is 12 x 12 m in size, with smallest details at about 1mm. This is a pattern from spirals of the Golden Ratio. The associated Corel Draw .cdr vector file is 12.36 x 20 m in size, with smallest details at about 1mm. with smallest details at about 1mm. One of the earliest fractal curves to be described, the von Koch snowflake was discovered by Swedish mathematician Helge von Koch in 1904. Like the Blancmange curve, it is continuous everywhere but differentiable nowhere. Its length at step n will be (4/3)^n of the original triangle perimeter; the fractal dimension is log 4/log 3 = approx. 1.26. Its area is 8/5 of the area of the original triangle, and its infinite perimeter (at the limit) encloses a finite area. This version shows the 1st-7th iterations in shades of grey. The associated Corel Draw .cdr vector file is 0.964 x 1.113 m in size, with smallest details at about 1mm. One of the earliest fractal curves to be described, the von Koch snowflake was discovered by Swedish mathematician Helge von Koch in 1904. 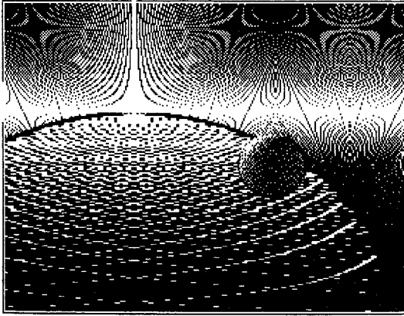 Like the Blancmange curve, it is continuous everywhere but differentiable nowhere. Its length at step n will be (4/3)^n of the original triangle perimeter; the fractal dimension is log 4/log 3 = approx. 1.26. Its area is 8/5 of the area of the original triangle, and its infinite perimeter (at the limit) encloses a finite area. This version shows the 1st-7th iterations successively smaller and smaller. The associated Corel Draw .cdr vector file is 0.964 x 1.113 m in size, with smallest details at about 1mm. One of the earliest fractal curves to be described, the von Koch snowflake was discovered by Swedish mathematician Helge von Koch in 1904. 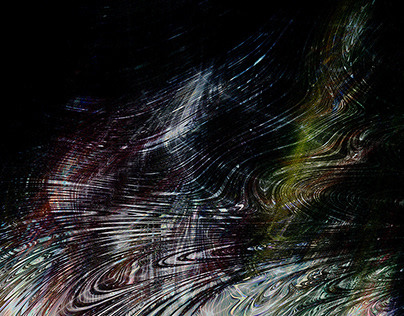 Like the Blancmange curve, it is continuous everywhere but differentiable nowhere. Its length at step n will be (4/3)^n of the original triangle perimeter; the fractal dimension is log 4/log 3 = approx. 1.26. Its area is 8/5 of the area of the original triangle, and its infinite perimeter (at the limit) encloses a finite area. This version shows the 1st-7th iterations successively smaller and smaller, alternating black and white. The associated Corel Draw .cdr vector file is 5 x 5.773 m in size, with smallest details at about 1mm. This fractal tiles the plane. Shown is its 6th iteration. It has 90 degree rotational symmetry. The associated Corel Draw .cdr vector file is 4 x 4 m in size, with smallest details at about 1mm. This fractal is a tile or tesselation, in 2 dimensions, continuous, so its fractal dimension is also 2. This version shows the 1st-4th iterations in shades of grey. The associated Corel Draw .cdr vector file is 330 x 376 mm in size, with smallest details at about 1mm. This fractal is a tile or tesselation, in 2 dimensions, continuous, so its fractal dimension is also 2. This version shows the 4th iteration. The associated Corel Draw .cdr vector file is 300 x 348 mm in size, with smallest details at about 1mm. The Pythagorean, or Pythagoras, treeThis fractal was invented by Dutch mathematics teacher Albert E. Bosman in 1942 Its iterations are relationships between the original square and successively smaller squares, as sides of triangles which fit the Pythagorean Theorem. If its initial square has a size of 1 × 1, the entire tree fits inside a 2 x 3 rectangle. Additionally, its finer details more and more closely fit those of Levys C curve. This shows the 13th iteration. The associated Corel Draw .cdr vector file is 0.668 x 1 m in size, with smallest details at about 1mm. This fractal was invented by Dutch mathematics teacher Albert E. Bosman in 1942 Its iterations are relationships between the original square and successively smaller squares, as sides of triangles which fit the Pythagorean Theorem. If its initial square has a size of 1 × 1, the entire tree fits inside a 2 x 3 rectangle. Additionally, its finer details more and more closely fit those of Levys C curve. This version has the 1st-15th iterations shaded with spheres. The associated Corel Draw .cdr vector file is 1.9 x 2.844 m in size, with smallest details at about 1mm. First described by Waclaw Sierpinski in 1916, the carpet is the 2-dimensional analogue of the 1-dimensional Cantor Dust. The fractal dimension of the carpet is approx. 1.8928, and its area at the iteration limit is zero. 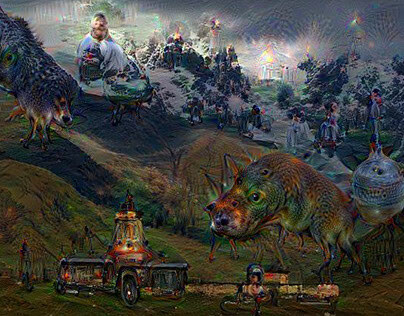 This version shows the 6th iteration rendered entirely in eyes. The associated Corel Draw .cdr vector file is 1.5 x 1.5 m in size, with smallest details at about 1mm. First described by Waclaw Sierpinski in 1916, the carpet is the 2-dimensional analogue of the 1-dimensional Cantor Dust. The fractal dimension of the carpet is approx. 1.8928, and its area at the iteration limit is zero. This version shows the 1st-8th iterations. The associated Corel Draw .cdr vector file is 15 x 15 m in size, with smallest details at about 1mm. First described by Waclaw Sierpinski in 1916, the carpet is the 2-dimensional analogue of the 1-dimensional Cantor Dust. The fractal dimension of the carpet is approx. 1.8928, and its area at the iteration limit is zero. This version is the 6th iteration, rendered in parts of a sphere. The associated Corel Draw .cdr vector file is 1.9 x 1.9 m in size, with smallest details at about 1mm. The twindragon curve is made from two dragon curves put end to end. It is also a tile of the plane. This version shows the 14th iteration as a continuous curve. The associated Corel Draw .cdr vector file is 0.716 x 1 m in size, with smallest details at about 1mm. First described by Waclaw Sierpinski in 1915, but also seen in 13th-century Cosmati mosaics in the cathedral of Anagni cathderal (Italy). Its fractal dimension is approx. 1.585, and it has zero area at the limit of iteration. This version shows the 1st-14th iterations in shades of grey. The associated Corel Draw .cdr vector file is 12.99 x 15 m in size, with smallest details at about 1mm. First described by Polish mathematician Waclaw Sierpinski, the Sierpinski continuous space-filling curve has dimension 2, being a line which fills the plane. This version shows the 1st-7th iterations in shades of grey. The associated Corel Draw .cdr vector file is 0.5 x 0.5 m in size, with smallest details at about 1mm. First described by Polish mathematician Waclaw Sierpinski, the Sierpinski continuous space-filling curve has dimension 2, being a line which fills the plane. This version shows the 6th iteration. The associated Corel Draw .cdr vector file is 0.573 x 0.573 m in size, with smallest details at about 1mm. This is the only pentagonal (5-sided) rep-tile, or shape which tiles itself with successively smaller copies, known. This version shows the 1st-9th iterations in shades of grey. The associated Corel Draw .cdr vector file is 1.097 x 1.9 m in size, with smallest details at about 1mm. The twindragon curve is made from two dragon curves put end to end. It is also a tile of the plane. This version shows the outline of the 18th iteration. The associated Corel Draw .cdr vector file is 1.705 x 2.132 m in size, with smallest details at about 1mm. Fractal from a 2x2 square, no. 285c. The associated Corel Draw .cdr vector file is 5 x 5 m in size, with smallest details at about 1mm. Progression from a line, 1d, to nearly a plane, 2d, through curves of fractal dimensions, including the von Koch Snowflake and the Cesaro Curve.The associated Corel Draw .cdr vector file is 10.591 x 16.657 m in size, with smallest details at about 1mm. This fractal is from a 3x3 Square. The associated Corel Draw .cdr vector file is 8.2 x 8.2 m in size, with smallest details at about 1mm. This fractal is from a 3x3 Square. The associated Corel Draw .cdr vector file is 20 x 20 m in size, with smallest details at about 1mm. This fractal is from a 3x3 Square. The associated Corel Draw .cdr vector file is 25 x 25 m in size, with smallest details at about 1mm. This fractal is from a 3x3 Square. The associated Corel Draw .cdr vector file is 10 x 10 m in size, with smallest details at about 1mm. This fractal, a more angular relative of the Blancmange Curve, is from a 4x4 Square. The associated Corel Draw .cdr vector file is 5 x 5 m in size, with smallest details at about 1mm. This fractal is from a 4x4 Square. The associated Corel Draw .cdr vector file is 3 x 3 m in size, with smallest details at about 1mm. This is a branching space-filling curve, here rendered to the 14th iteration and in curved instead of straight line segments. The associated Corel Draw .cdr vector file is 0.802 x 1.141 m in size, with smallest details at about 1mm. This is a branching space-filling curve, here rendered to the 14th iteration and in curved instead of straight line segments. The associated Corel Draw .cdr vector file is 0.801 x 1.134 m in size, with smallest details at about 1mm. A fractal which bifurcates, or divides into 2, repeatedly; arranged in a pattern from a Golden Ratio spiral. The associated Corel Draw .cdr vector file is 1.9 x 3.074 m in size, with smallest details at about 1mm. A fractal which began as a 2x2-size square. The associated Corel Draw .cdr vector file is 6 x 6 m in size, with smallest details at about 1mm. A fractal which began as a 2x2-size square. The associated Corel Draw .cdr vector file is 4.583 x 5 m in size, with smallest details at about 1mm. 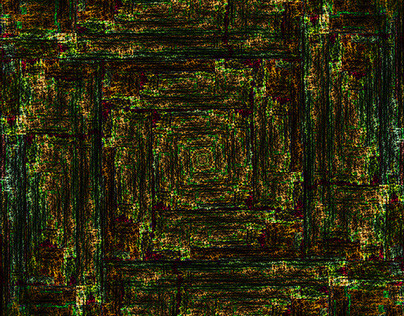 Fractal from a 2x2 square, no. 186a. The associated Corel Draw .cdr vector file is 8 x 8 m in size, with smallest details at about 1mm. 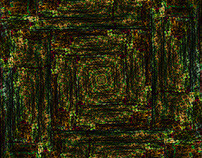 Fractal from a 2x2 square, no. 186f. The associated Corel Draw .cdr vector file is 8 x 8 m in size, with smallest details at about 1mm. Fractal from a 2x2 square, no. 186i, here in a "dragon" tiling of 2. The associated Corel Draw .cdr vector file is 6.458 x 7.916 m in size, with smallest details at about 1mm. Fractal from a 2x2 square, no. 186j. The associated Corel Draw .cdr vector file is 3.511 x 5.155 m in size, with smallest details at about 1mm. 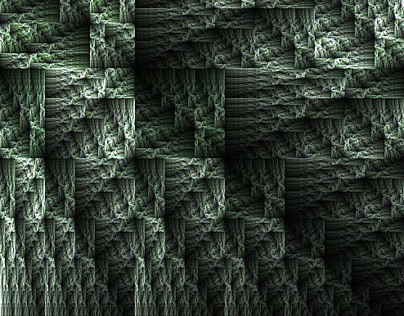 Fractal from a 2x2 square, no. 285. The associated Corel Draw .cdr vector file is 4.166 x 5 m in size, with smallest details at about 1mm. This fractal tiles the square in 2 pieces, each rotated 180 degrees from the other, here shown as black and white on a grey ground. Fractal from a 2x2 square, no. 356. The associated Corel Draw .cdr vector file is 4.5 x 6 m in size, with smallest details at about 1mm. Fractal from a 2x2 square, no. 570a. The associated Corel Draw .cdr vector file is 1.9 x 2.09 m in size, with smallest details at about 1mm. Fractal from a 2x2 square, no. 575, lines. The associated Corel Draw .cdr vector file is 3 x 4 m in size, with smallest details at about 1mm. Fractal from a 2x2 square, no. 575. The associated Corel Draw .cdr vector file is 12 x 16 m in size, with smallest details at about 1mm. Fractal from a 2x2 square, no. 575. The associated Corel Draw .cdr vector file is 2 x 2.667 m in size, with smallest details at about 1mm. Fractal from a 2x2 square, no. 610. The associated Corel Draw .cdr vector file is 1.9 x 1.9 m in size, with smallest details at about 1mm. Fractal from a 2x2 square, no. 2224. The associated Corel Draw .cdr vector file is 1.9 x 2.528 m in size, with smallest details at about 1mm. Fractal from a 2x2 square, no. 2226. The associated Corel Draw .cdr vector file is 1.9 x 2.749 m in size, with smallest details at about 1mm. 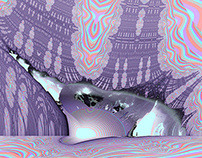 Fractal from a 2x2 square, iterations in shades of grey. The associated Corel Draw .cdr vector file is 4 x 4 m in size, with smallest details at about 1mm. Fractal from a 2x2 square, here in a "dragon" tiling of 2. The associated Corel Draw .cdr vector file is 4.125 x 6.125 m in size, with smallest details at about 1mm. A fractal based on a heptagon. The associated Corel Draw .cdr vector file is 1.9 x 1.949 m in size, with smallest details at about 1mm. A fractal based on a heptagonal star, iterations in tones of grey. The associated Corel Draw .cdr vector file is 1.9 x 1.949 m in size, with smallest details at about 1mm. A fractal based on a heptagonal star, 6th iteration. The associated Corel Draw .cdr vector file is 1.9 x 1.949 m in size, with smallest details at about 1mm. A fractal starting with hexagons, going to many von Koch Snowflakes in a Sierpinski Carpet formation, iterations in shades of grey. The associated Corel Draw .cdr vector file is 1.732 x 2 m in size, with smallest details at about 1mm. 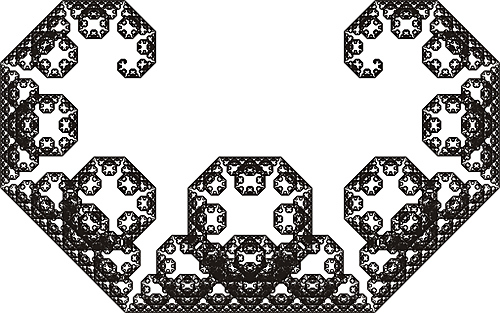 A Sierpinski carpet fractal of von Koch Snowflakes. The associated Corel Draw .cdr vector file is 1.9 x 2.193 m in size, with smallest details at about 1mm. 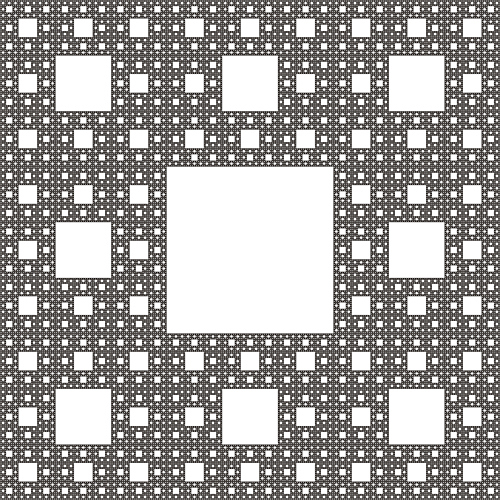 A Sierpinski carpet fractal of von Koch Snowflakes, iterations in tones of grey. The associated Corel Draw .cdr vector file is 2.596 x 3 m in size, with smallest details at about 1mm. 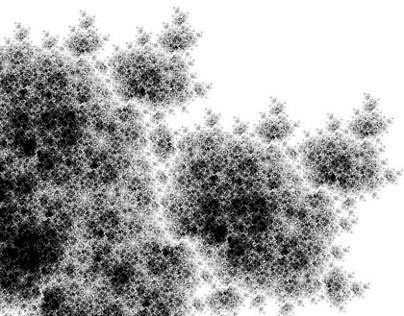 A formation of Koch Snowflake fractals, iterations in tones of grey. The associated Corel Draw .cdr vector file is 3 x 3.464 m in size, with smallest details at about 1mm. From a hexagon to the Sierpinski Gasket fractal, iterations in greys. The associated Corel Draw .cdr vector file is 1.732 x 2 m in size, with smallest details at about 1mm. A triangular version of the Sierpinski Carpet, 11th iteration, rendered here in spheres. The associated Corel Draw .cdr vector file is 1.9 x 2.193 m in size, with smallest details at about 1mm. The octagonal star version of the Sierpinski Gasket fractal, rendered in smaller octagons. The associated Corel Draw .cdr vector file is 5 x 5 m in size, with smallest details at about 1mm. A fractal based on an octagonal star, iterations in grey tones. The associated Corel Draw .cdr vector file is 1.9 x 1.9 m in size, with smallest details at about 1mm. Octagonal version of the von Koch Snowflake fractal. The associated Corel Draw .cdr vector file is 3 x 3 m in size, with smallest details at about 1mm. 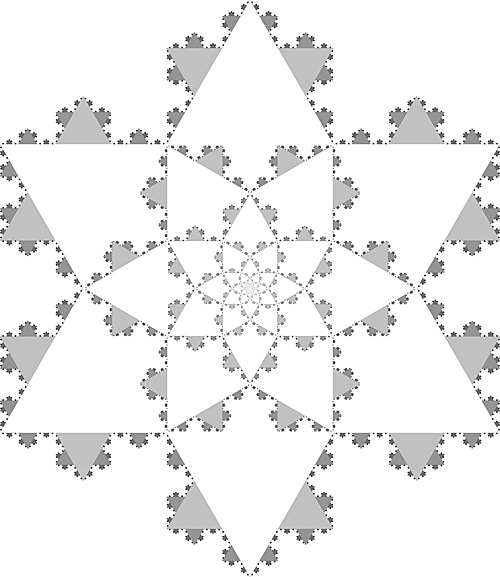 A fractal based on octagons. The associated Corel Draw .cdr vector file is 5 x 5 m in size, with smallest details at about 1mm. 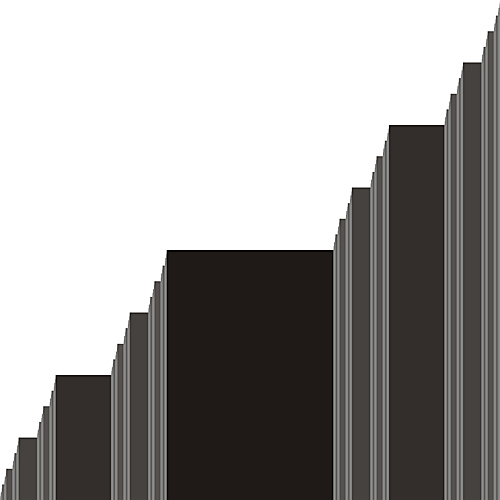 The Peano space-filling curve, 4th iteration. The associated Corel Draw .cdr vector file is 1 x 1 m in size, with smallest details at about 1mm. 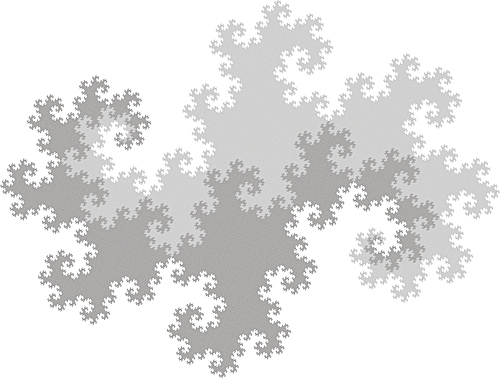 6 Copies of the Pentagonal Version of the von Koch Snowflake fractal (or of the Cesaro Curve), in greys. The associated Corel Draw .cdr vector file is 1.9 x 2 m in size, with smallest details at about 1mm. Pentagonal version of the Sierpinski Carpet, made from successive half-size pentagons. The associated Corel Draw .cdr vector file is 4.755 x 5 m in size, with smallest details at about 1mm. A fractal based on a pentagonal star, iterations in greys. The associated Corel Draw .cdr vector file is 1.976 x 1.88 m in size, with smallest details at about 1mm. A fractal based on a pentagonal star. The associated Corel Draw .cdr vector file is 1.9 x 1.997 m in size, with smallest details at about 1mm. A fractal based on a Cesaro Curve. The associated Corel Draw .cdr vector file is 0.951 x 1 m in size, with smallest details at about 1mm. A right triangle version of the Sierpinski Gasket, here rendered with shaded spheres. The associated Corel Draw .cdr vector file is 1.875 x 1.875 m in size, with smallest details at about 1mm. A right triangle version of the Sierpinski Gasket, here rendered with small shaded spheres. The associated Corel Draw .cdr vector file is 1.9 x 1.9 m in size, with smallest details at about 1mm. A circular version of the Sierpinski Carpet, 6th iteration, here distorted. The associated Corel Draw .cdr vector file is 1.9 x 1.9 m in size, with smallest details at about 1mm. A circular version of the Sierpinski Carpet, 6th iteration. The associated Corel Draw .cdr vector file is 1.9 x 1.9 m in size, with smallest details at about 1mm. A heptagonal version of the Sierpinski Carpet, 8th iteration, in lines. The associated Corel Draw .cdr vector file is 1.9 x 1.948 m in size, with smallest details at about 1mm. A heptagonal version of the Sierpinski Carpet, 8th iteration. The associated Corel Draw .cdr vector file is 1.9 x 1.948 m in size, with smallest details at about 1mm. A pentagonal version of the Sierpinski Carpet, 13th iteration. The associated Corel Draw .cdr vector file is 15 x 15.771 m in size, with smallest details at about 1mm. 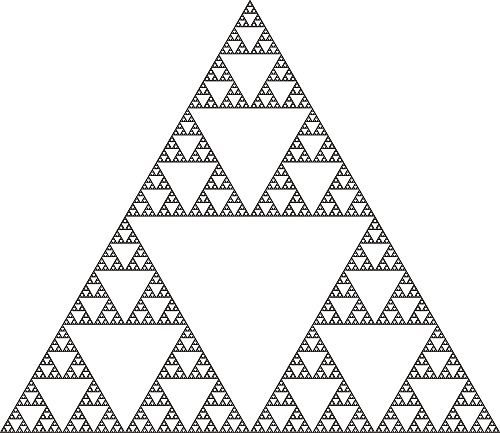 A triangular version of the Sierpinski Carpet, 11th iteration. The associated Corel Draw .cdr vector file is 1.9 x 2.193 m in size, with smallest details at about 1mm. A fractally branching tree, copied, 10th iteration. The associated Corel Draw .cdr vector file is 1.9 x 1.9 m in size, with smallest details at about 1mm. 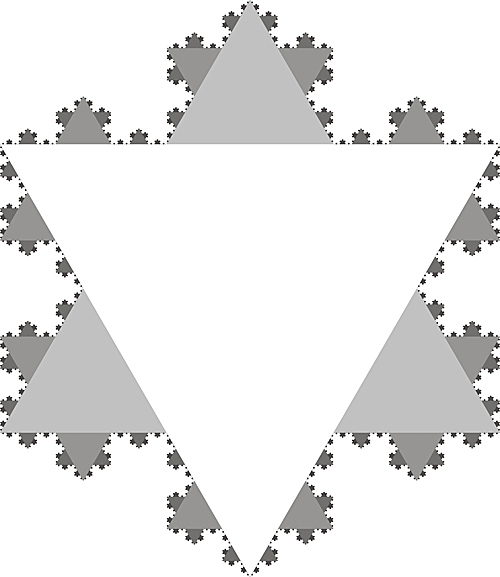 Hexagonal version of the Sierpinski Gasket, encompassing many von Koch Snowflake curvess; 8th Iteration. The associated Corel Draw .cdr vector file is 6.924 x 8 m in size, with smallest details at about 1mm. 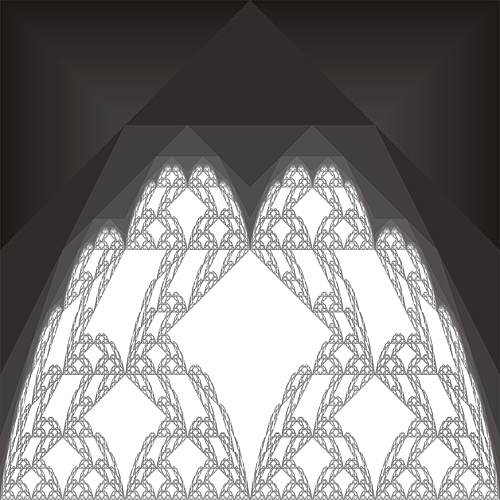 The Sierpinski Gasket fractal rendered in a single, non-crossing line, 8th iteration, copied. The associated Corel Draw .cdr vector file is 0.433 x 0.5 m in size, with smallest details at about 1mm. Fractal based on the Golden Ratio, 10th iteration. The associated Corel Draw .cdr vector file is 4 x 4 m in size, with smallest details at about 1mm. Fractal based on the Golden Ratio, 10th Iteration. The associated Corel Draw .cdr vector file is 5 x 5 m in size, with smallest details at about 1mm. Fractal based on a 3x3 square. The associated Corel Draw .cdr vector file is 3.466 x 4.266 m in size, with smallest details at about 1mm. Fractal based on a 2x2 square. The associated Corel Draw .cdr vector file is 2.856 x 4 m in size, with smallest details at about 1mm. Fractal based on a 3x3 square. The associated Corel Draw .cdr vector file is 15 x 15 m in size, with smallest details at about 1mm. Fractal based on a 2x2 square. The associated Corel Draw .cdr vector file is 20 x 20 m in size, with smallest details at about 1mm. "Sierpinski Blancmange" fractal based on a 2x2 square. The associated Corel Draw .cdr vector file is 8.1 x 8.1 m in size, with smallest details at about 1mm. Fractal based on the square root of 2. The associated Corel Draw .cdr vector file is 20 x 20 m in size, with smallest details at about 1mm. Fractal based a 2x2 square. The associated Corel Draw .cdr vector file is 5 x 5 m in size, with smallest details at about 1mm. Fractal based a 2x2 square, "Escher" tiling of iterations 3-14 in greys. The associated Corel Draw .cdr vector file is 8 x 8 m in size, with smallest details at about 1mm. Fractal based on a 3x3 square. The associated Corel Draw .cdr vector file is 8 x 8 m in size, with smallest details at about 1mm. Fractal based on a 2x2 square. The associated Corel Draw .cdr vector file is 8 x 8 m in size, with smallest details at about 1mm. The Cesaro Curve fractal turned into a tiling triangle, 6th iteration. The associated Corel Draw .cdr vector file is 1.9 x 1.938 m in size, with smallest details at about 1mm. 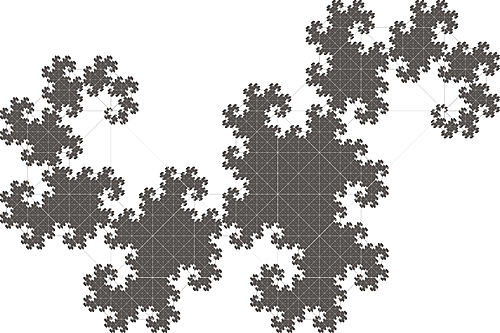 The von Koch Snowflake fractal turned into a tiling triangle, 6th iteration. The associated Corel Draw .cdr vector file is 1.9 x 1.919 m in size, with smallest details at about 1mm. Fractal from Golden Ratio triangles. The associated Corel Draw .cdr vector file is 1.945 x 2.245 m in size, with smallest details at about 1mm. A Golden Ratio tree fractal. The associated Corel Draw .cdr vector file is 1.9 x1.9 m in size, with smallest details at about 1mm. Triangluar version of the Sierpinski Carpet fractal. The associated Corel Draw .cdr vector file is 4 x 4.618 m in size, with smallest details at about 1mm. Fractal from Golden Ratio triangles. 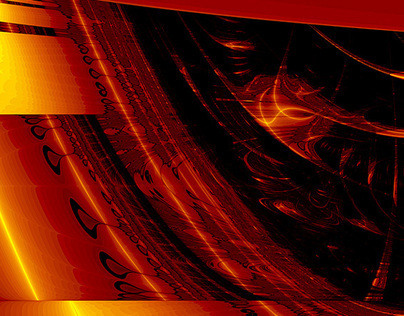 The associated Corel Draw .cdr vector file is 1.978 x 2 m in size, with smallest details at about 1mm. The 45-degree cross section through the centre of a 7th-iteration Menger Sponge 3d fractal, its cubic holes at this angle transformed into hexagonal stars. The associated Corel Draw .cdr vector file is 1.732 x 2 m in size, with smallest details at about 1mm. The 8th-iteration version's .cdr vector file, however, is 10.395 x 12 m in size, with smallest details at about 1 mm. The 45-degree cross section through the centre of a 7th-iteration Menger Sponge 3d fractal, its cubic holes at this angle transformed into hexagonal stars and each star rendered with a glow. The associated Corel Draw .cdr vector file is 1.732 x 2 m in size, with smallest details at about 1mm. 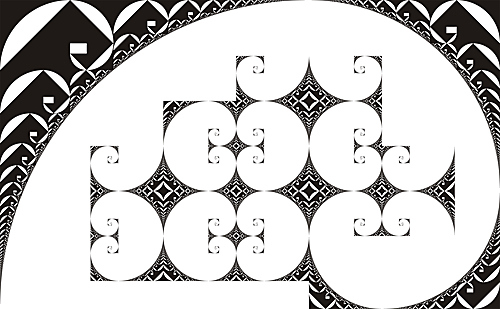 World's largest fractals in vector format, all black and white, up to 32 metres wide with smallest details at 1 mm.